Indian Oil Corporation Limited (IOCL) joined in as co-sponsor of Kalinga Lancers team of Hockey India League for the 2016 season on Thursday. 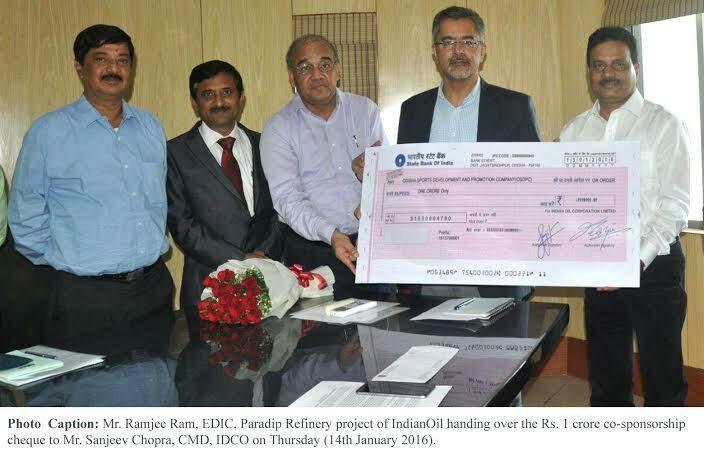 On behalf of Indian Oil Corporation, Mr. Ramjee Ram, Executive Director (In-Charge) of Paradip Refinery project handed over the Rs. One crore co-sponsorship cheque to Mr. Sanjeev Chopra, CMD, IDCO and Chairman, Odisha Sports Development Promotion Company, which manages Kalinga Lancers team, at IDCO office, Bhubaneswar on Thursday (14th January 2016). Shri W R Borbora, General Manager – HR of Paradip Refinery project was also present on the occasion. It may be noted here that IndianOil has been a co-sponsor of Kalinga Lancers team in the two previous seasons of Hockey India League in 2014 & 2015. IndianOil has the proud distinction of having 13 Arjuna awardees amongst its glittering squad of sports stars. IndianOil’s P. Gopichand, has not only been conferred with the Arjuna Award(1999), but other prestigious awards like Rajiv Gandhi Khel Ratna (2001), Padma Shri (2005), Dronacharya Award(2009), and Padma Bhushan( 2014). IndianOil has been championing cause of sports development for over three decades now. In line with the sports policy it adopted in 1985, the Corporation has over the years, recruited many promising sportspersons, who have gone on to reach their peak in their chosen disciplines. Since 2006, IndianOil has also been conferring sports scholarships to promising young sports persons representing the State in indoor and outdoor games. The scheme which started in 2006 with 55 scholarships in 7 games / sports has now been augmented to offer 150 scholarships for 19 games/ sports to upcoming junior players between 14 -19 years of age.